One of the most critically-acclaimed games of all time finally comes to PC, and in style: Experience 360 degrees of mind-blowing synesthesia as you blast through waves of enemies and giant transforming bosses, with colors and sounds that sync and blend to the beat of Rez's legendary techno soundtrack. Whether you choose to play in standard desktop mode or opt for the full immersion of playing in VR, Rez Infinite must be seen—and heard—to be believed. Fully remastered classic Rez levels Areas 1 through 5, and an all-new free-flying experience in Area X. Unrestricted resolution and up to double the texture resolution of any previous version of Rez makes for razor-sharp visuals. 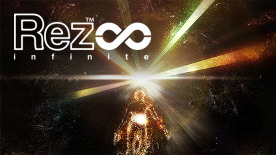 Full 3D audio for Rez's incredible music and sound effects. The entire game is playable on your desktop, or in full VR with your HTC VIVE or Oculus Rift headset and accompanying controllers (standard gamepads, Vive Controllers, and Oculus Remote and Touch controllers are all supported).